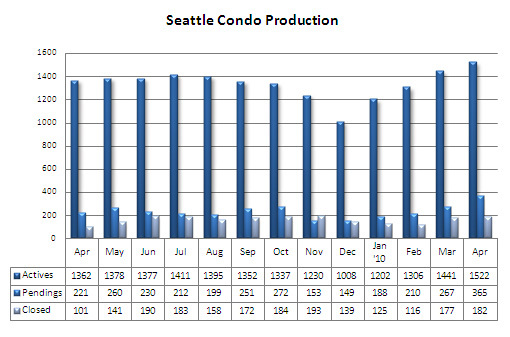 All around, April 2010 was a very good month for Seattle’s condo market. The results were rather phenomenal considering how the local market has fared over the past few years. 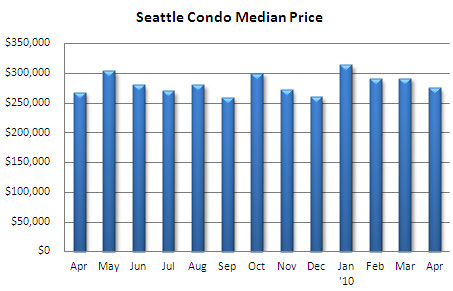 The year-over-year Seattle condo median price rose 2.6% to $275,000, not a lot, but that was the third consecutive increase in median price, which hasn’t occurred since 2007. The one month median price did fall 5.5% from March, though going back to 2006, April’s median price has always been lower than March’s, so I’m calling that cyclical. The number of condos going under contract (pending transactions) increased 65.2% over last April while closed sales jumped 80.2%. 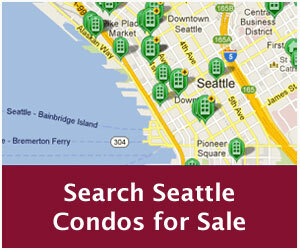 The number of active condo listings continued to rise, up another 11.8% last month to 1,522 units listed in the NWMLS. 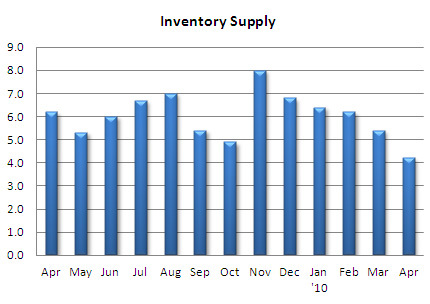 Fortunately, for now, the strong sales velocity has kept the inventory supply relatively low. The supply rate was down to 4.2 months citywide in April, though in several areas (downtown and North Seattle), the rate dipped into the 3’s…nearly seller market conditions. Though, much of the increased sales volume over the past few months have been attributable to the federal home buyer tax credits. With the credits having expired on April 30th, combined with rising inventory, we’ll see a shift back to a buyers market. The rising inventory level is a little alarming. 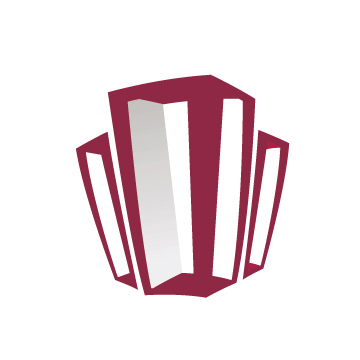 The number of active listings peaked at 1,662 units in May 2008 and the market is presently trending in that direction. 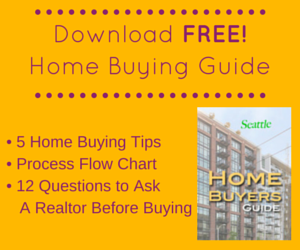 Though, whether that’s good or not-so-good news probably depends on whether you’re a seller or a buyer. As a seller, it may portend increased competition and further price volatility; as a buyer it’ll mean more choices and potentially better values. And, many believe the end of the tax credits will force prices downwards. On one hand, that’ll help incentivize further sales, thus absorbing inventory and stabilizing the market. On the other hand, it’ll be on the backs of sellers who, if they had purchased in the past 2-3 years, are likely selling at a loss. Going forward, we’ll see another month of strong closed sales figures in May due to the lag between when units goes under contract and closing. I’m going to guess over 200 closed sales for May. Pending transactions will drop steeply. There were 365 pending transactions in April, the most in a single month since July 2007, the month before the condo market crashed. We’re not likely to see that volume again for some time to come. 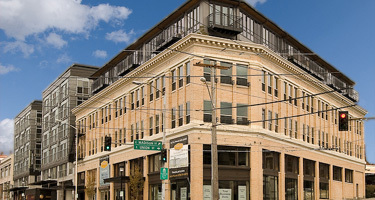 One interesting tidbit is that upper-end condos are moving. 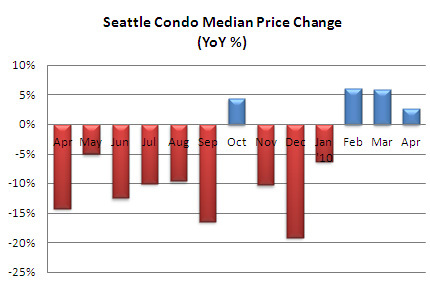 Last April, only 7 condos sold were priced over $500,000, this April there were 23. 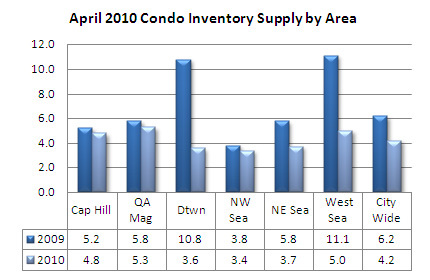 As a percentage of total condo sales, $500,000+ units accounted for 6.9% in April 2009 and 12.6% in April 2010. As Seattle’s excess inventory is primarily in the $500,000+ range, it’s a great sign that they’re selling.